If you’ve updated your iPhone or iPad to the latest version of iOS (iOS 8.4.1 or iOS 9, with Apple Music), you’ll find that Siri now has the ability to play various sound effects. Whether it’s the sound of fireworks, running water, a camp fire, dogs barking, or, uh, some more lewd sound effects too, Siri will play them all. Get creative, Siri now has a large repertoire of sound effects available to the virtual assistant through a huge sound effect library that you can now access from your iPhone, iPad, or iPod touch. Just ask and see if the virtual assistant can find a sound to match. You can even request some more lewd sound effects if that’s your thing, which could be entertaining for a prank, or if you’re 12 year sold, or just an inner 12 year old sometimes (hey, me too!). And a warning in advance since this is totally juvenile and somewhat ridiculous, but if you want to hear something really quite strange and rather amusing, ask Siri to “play loud farts” … no you won’t get what you think, and this is where things get really weird, as CultOfMac discovered rather than sounds of trumpeting flatulence, Siri will play a pop song called “What’s my Name” from artist “Rihanna” – LOL! (Update: the ‘play loud farts’ thing seems to have changed from playing a pop song to, well, the actual sound of flatulence, so enjoy that or don’t, oh Siri). So yea, Siri still has a sense of humor… though if you’re looking for something a bit more serious (Siri-ous? OK I’ll go home now), you’ll probably find these other commands to be much more useful. Tried all here and it just try to play songs. No sound effects will play. Have the 8.4.1 update and tried it plugged in to power and on battery. What is wrong? Is it an iOS 9 only thing? The sound effects work in iOS 8.4 and newer if you have Apple Music, even the free trial is fine. Got it on iOS 9 right now, sounds pretty silly. Apple should make this universal, why do you need some streaming music service to play sound effects? I’ve tried several of these and none seem to be doing what you describe. 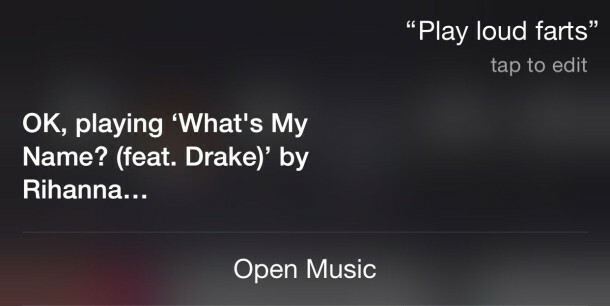 Siri just keeps looking for music to play. I have 8.4.1 and Siri does not do this. She only play songs and radio stations. Doesn’t recognise any of the commands. Looks like we are all having the same problem. Is there something we are all missing? Bummer. Not working for me, either. Is it April 1? I think you have to be using Apple Music for this to work, as it accesses sound effects from iTunes music. Fart sounds come from Dr Sound Effects, Squeeze It Out album. I can assure you, I don’t have that one in my library. If you have an Watch, you can hide your phone near a victim, invoke Siri on the watch, ask to play fart sounds and the audio comes from the hidden phone. Kids love that one. Yes that seems to be correct, Apple Music is required for access to the sound effect library with Siri, at least for the time being. This is why you need iOS 8.4+ or iOS 9+. Just updated to 8.4.1 on my 6+. I can confirm these commands do NOT work. Did more than one person test this? This is fun. Yes, this is fun. Maybe you need to have Apple Music? Maybe that’s the sound effect library source? So I think it is indeed Apple Music where the library is, if you hid the service you won’t have it? Yes, correct, you need Apple Music to access the sound effects from Siri. This is stated twice in the article, and like 1000 times in the comments. Amazing, here we are again, people don’t read anything, they just complain. The comment section on this article is like a microcosm of modern America, it helps to explain why the nation is in such bad shape. Nobody reads or pays attention to the facts, they just complain. At best they hear some talking point from a corrupt blowhard or get some propaganda from the corporate rightwing media and repeat it mindlessly like some kind of parrot drone. You people, look at yourselves! No wonder the country has fallen apart in the past 20 years! You won’t even read, you get outraged by your ignorance, and then you act like a bunch of spoiled kids complaining about something you don’t even bother to learn about! Are you surprised things are in the toilet? Maybe you should ask Siri for something else? Actually, you may not be aware of the fact that the article got edited AFTER people starting leaving comments that it did not work. Bottom line: writer did not check his work. Actually, Siri plays sound effects fine, and the article specifically stated that iOS 8.4 or iOS 9 was required and it mentioned Apple Music, the article was *clarified* after so many commenters didn’t read anything and just went straight to complaining. I’ve been following this article, people didn’t test it themselves or read how to do it. Siri uses Sound Effects from a library on Apple Music, that’s on the Music app on a new phone, no music use, no music app, no sound effects, easy. I’m not signing up for Apple music (free or otherwise) just for this non-sense. It works fine with Apple Music but you make a good point, why do we need Apple Music to play sound effects?!? Too bad, was looking forward to all this! None of these seem to work, it just tries to play songs. Maybe it’s only if you have iOS 9 or Apple Music. Very strange. You have to have signed up for apple music for this to work. As stated in the article. No need to post that it doesn’t work, as that just demonstrates that you didn’t sign up for apple music. Or can’t read. That does NOT say that you have to have signed up for Apple Music. I can disable and hide without signing up just fine. The note is misleading at best, as it appears that you must have at least signed up for the trial for the sound effects to work. Or maybe *you* can’t read. Siri sound effects require Apple Music. You aren’t using Apple Music, so you can’t use and access the sound effects. That’s pretty simple to get, what’s your problem? Can you be a bigger grump? Relax, it’s just some silly sounds! Which was basically my point, Philip. Bashing someone (the “Or can’t read” quip) for being confused by an ambiguous article is pretty low, especially given that several dozen others made the same mistake. There’s no technical reason why Apple couldn’t have allowed the sounds to stream in realtime regardless of whether one has signed up for Apple Music, though I suspect that there are legal issues. Since none of this is actually spelled out by Apple, we’re all just guessing. Not being a grump. I just don’t like bullies. Confirmed that it works in iOS 8.4.1 but you must have Apple Music. That’s where the sound effect library is stored. You think Apple would waste storage in your phone by including umpteen fart sound effects? Seriously people, use your heads.